The B.Sc. in Operation Theatre and Anaesthesia Technology course is related to the management of the Operation Theatre. The course prepares the student for managing the patients, looking after surgical instruments and their sterilization and safety. The students are trained in both theoretical & practical aspects of Operation Theatre technology to assist surgical teams during operation. anaesthesiologists. They will be trained by expert personnel in Basic life Support, Airway management in emergency situations and Cardiopulmonary resuscitation. The course is of 3 years duration plus one-year internship. 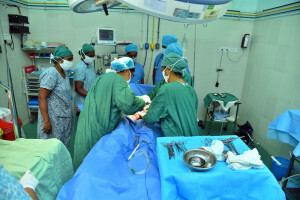 On successful completion of the course a Bachelor of Science degree in operation theatre and Anaesthesia technology is awarded by the Tamil Nadu Dr. M.G.R. Medical University.